Nothing says winter like curling up in front of a toasty fire with a mug of cider or hot chocolate. Wood burning fireplaces remain a popular way to heat your home and add ambiance on a cold winter night. But no one likes a smoky room, piles of ash, or the chance of a house fire. 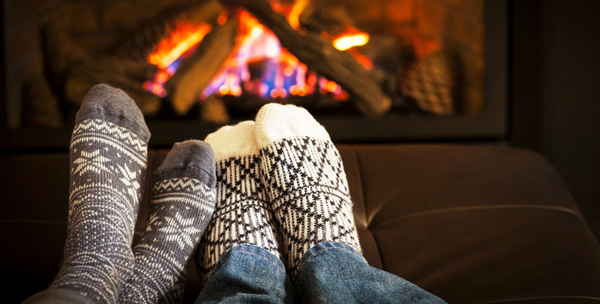 Use proper care to keep your fireplace burning cleanly all winter long. Here are some tips for your fireplace maintenance. The basic idea of fireplace care is to keep the fireplace clean and in good repair. The enemy: creosote. Creosote is a tar like substance formed by unburned gasses from wood fires. Keeping the fireplace clean is not just about being tidy; a dirty fireplace can cause a house fire. According to the National Fire Protection Association, failing to clean creosote from chimneys is one of the leading factors in house fires from heating sources (28%). Keeping your chimney clean of flammable creosote is one of the most important chimney care tasks. Only burn well-seasoned hardwood like oak, maple, birch, almond wood, and fruitwood. Green wood and softwoods like pine, cedar, and spruce cause smoky fires and creosote buildup. Hardwoods burn hotter and cleaner. Have your fireplace inspected and cleaned by a chimney sweep at least once a year and more often if your household uses the fireplace daily or if see soot and creosote buildup. Keep an eye on your fireplace and regularly check the interior for creosote and soot. Inspect or have the chimney sweep inspect the chimney cowl. The cowl keeps wildlife like birds and squirrels, rain, and debris from getting into the chimney. The cowl is important because the sides allow smoke to escape. If the sides becomes blocked, the air quality of your home could suffer. There should not be smoke inside your home. Get fires burning as hot as possible, as quickly as possible to minimize smoke and incomplete combustion. If your fireplace is smoking, it is likely either due to an incorrect flue design or creosote buildup. Once the fire is burning well, the flue should be open just enough to let the smoke escape. (If you are using a fireplace with a damper). Do not let ashes build up in the fireplace. Keep a one-inch layer of ash in your fireplace during burning season to protect the floor of the fireplace and insulate coals. Do not let the ashes build up to the grate as this will cause the grate to wear more quickly. Make sure ashes are completely cool before cleaning them out of the fireplace. Do not leave ashes in the fireplace year round as they are acidic and can draw moisture. Consider getting your chimney lined with a stainless steel liner for maximum fire safety. With proper care and use, a wood-burning fireplace can heat and beatify your home for years to come. Contact Beauty Fires if you require a chimney sweeper in your area.